James Lynn, Goldsmith: Mokume+Gane+Wedding+Rings: "Spiritual and scientific, aesthetic and technical. Mokume hints at the mystery and wonder of our complex reality..."
For years, I used only one type of mokume in my rings and other jewelry, except for a couple of experimental patterns I named “Snakeskin” and “Dragonskin.” Recently, I’ve developed a new pattern called “Green Banks,” described below. I use the red and green golds because of their high color contrast. I mix these alloys myself from the pure metals, because I prefer the colors I can achieve to ready-made commercial alloys. The silver in Red, Green, & Silver is there to act as a separator. Since the silver can be etched away slightly without affecting the gold, it allows me to create a textured surface. The texture is appealing in itself, and helps the smooth gold lines to stand out. I also usually oxidize the silver to a charcoal black color to further enhance the visual impact of the pattern. 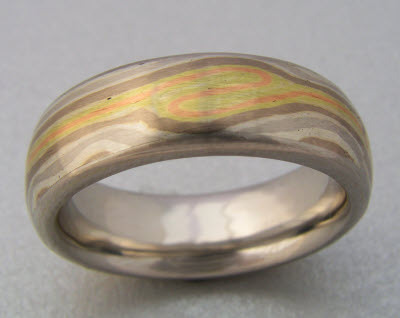 A unique feature of this type of mokume is that there is little or no discontinuity where the ends of the pattern meet. I called it Green Banks because it resembles a red river with green banks, flowing through hills. Experimentation showed that this pattern looks better without etching, so I leave it smooth. If the metals in a mokume pattern are polished too highly, the distinctiveness of their colors can be diminished, so I use a matte finish on the mokume surface. The inner liner, and the rims if any, can be made of any precious metal, including platinum. I generally put a high polish on these. Pairs of rings can be made with identical or mirror-image patterns, regardless of size differences. Different widths of mokume or of rims, comfort fit (where the inner surface of the ring is curved, instead of flat, from edge to edge), stone settings, and varied designs are all available on request. Look in the gallery for ideas! I Don't Know My Ring Size! If you don't know your ring size, I can send you a ring sizer to try on. It's important to measure carefully. Phone or email me for advice on the best way to do this. I can re-size my mokume gane rings (+/- 1 size), but it's more involved than a typical ring sizing. If you should ever need your mokume ring re-sized, please allow me to do it. Other goldsmiths, no matter how skilled, are unlikely to obtain the best results. With so many possible variations, each ring is designed and priced individually. Obviously, the precious metals market, which fluctuates constantly, is also a factor. Visit my Design/Purchase page to explore options and view a quote! I require a one-half deposit to commit to the order, with the balance due on delivery. I want only satisfied clients, so I will do whatever I can to make sure that you become one. Aside from mokume rings, of which I have made hundreds, pricing custom jewelry is almost harder that making it. It requires estimating the materials (easy) and the labor (difficult) needed to make something I have never made before. Nevertheless, I have not deviated from an estimate in decades, unless metals prices changed radically during the fulfillment of the commission. Consultation about your order will cost you nothing, but I charge $100 for detailed designing, whether by hand or by computer. The design fee is non-refundable. I am only able to accept a limited number of commissions these days. If I can not carry out your piece myself, I know many other highly skilled goldsmiths I can recommend.